Here is a great example (pdf) from the ILO evaluation office of using cartoons to explain an evaluation process / service; it just shows that visual methods can also be used to explain evaluation processes and services – in addition to communicating evaluation results. I am sharing Today’s readings from the catholic liturgy with you along with some of my rambling and uncoordinated reflections on them. The uniting theme in the first and third readings this Sunday is that of HUMILITY. Our God, through these readings invites us to be, become and remain humble. The gospel chooses a social event we can all relate to – a wedding, to illustrate how critical it is to be humble. In a world where we all grow up acquiring assertiveness, self-focus and self-marketing as key survival and social mobility skills, a message that focuses on humility is not very likely to receive the warmest of receptions. Yes, such a message could be perceived as irrelevant, outdated and in fact, threatening and subversive. And yet this same message that we could see as subversive with its key focus on humility should indeed be one of the principal chapters in our Vade Mecum, our little journey companion booklet of useful precepts for a happy life on earth and the hereafter. Humility is salutary and elevating for all of humanity who God created in an act of humility (making humanity in His own image and likeness) and boundless love. Later when humanity fell from a combination of a failure of humility and unbridled aspiration, God again reunited/reconciled humanity to Himself through another act of love involving Jesus Christ who himself was and is a perfect model of humility. However, in life, it is not uncommon to find that we as humans turn away from God’s precepts for effective living, given what we consider to be the unpalatable nature and “subversive-ness” of God’s logic. Yet our judgments on such matters are flawed precisely because of the time bounded-ness of human rationality! For are we not reminded, and correctly too, that what is wise to us humans could be folly in God’s scheme of things. But let us return for a moment on the situation in the parable and you will immediately also see why it is prudent and practical to show humility. You arrive at a social event. Knowing yourself to be Mr. or Mrs. “Big Stuff”, the Boss, you immediately place yourself high, on the high table, as the expression now goes in Nigeria. And as you settle in to enjoy your high status and what you imagine to be the envy of those not as privileged as you in the audience, someone higher and “bigger” than yourself arrives and the Master of Ceremonies promptly moves you down – you are down stepped, rank shifted but to a lower level! You lose face! You are embarrassed! You could have avoided this with some humility! You are now the center of attention but for the wrong reasons and right at this moment I suspect that you begin to appreciate the jeopardy and sad destination that your pride, arrogance and lack of humility have led you to. Those who lack humility eventually drink from the bitter cup of humiliation and disgrace. And faint echoes from the scripture verses that God comes against the arrogant and the proud and elevates the lowly begin to hum in your head. The wages of the vice of lack of humility is humiliation – public and personal! I am sure the reader has come across instances where lack of humility has shown its ugly face. And the instances are myriad – from the big man and woman who refuse to take their places in queues in public places, through to the inflated public servant who uses the siren to navigate his/her unnecessary convoy in our crowded and manner-less traffic and thereby compound its challenges to the “academic”, who lacking any real self knowledge and utterly deficient in emotional intelligence, prances around in our social spaces and media in vain efforts to project himself/herself by trying to comment/pronounce on everything under the sun, and who ends up displaying not knowledge but the profundity of his/her superficiality and biases. The vices of arrogance and egoism drive such people and occlude their eyes and ears to the appeals of good sense, but eventually humiliation proves to be their nemesis, as it is for all who reject humility. Let us now turn and look at the rewards of humility. Christ humbled himself even to becoming a man and further to enduring death on the cross and because of this humility, He has been elevated above all creatures and sits at the right hand of God. The image of the suffering servant in Isaiah 53 stands in sharp contrast to that of the Messiah clothed in glory! The difference is clear. You humble yourself, God exalts you, God elevates you; you elevate yourself, God humbles you! This is the complete reversal of logic, at least to us humans. The Beatitudes are another part of the Christian scriptures that overflow with this same reversal of and challenge to conventional wisdom. (I use “conventional wisdom” in the sense that JK Galbraith, that famous scholar and economist, used it to describe a self-serving, convenient and “feel good” wisdom/belief that is in vogue even when its purveyors know that it is not always true – here, expedience and convenience triumph over truth and true wisdom). But let us return to our main theme of the uplifting value of humility, how by lowering oneself before God, you actually get to elevate yourself. Read Matthew’s account of the “Sermon on the Mount” and you will notice a similar subversion. You will be jolted by it. On the question of humility, verses 3 and 4 are most apposite, though there is an internal coherence in all these “reversed” values, for it is only when one is truly meek and poor in spirit (read poor in spirit to mean “one who disdains haughtiness, egoism, arrogance, self-pride and abandons himself/herself willingly to God’s superior reason and logic”) that one becomes clean of heart, can show mercy, can become a peacemaker etc. And notice the rewards – inheriting the earth, admission into the kingdom of heaven, comfort, receiver of mercies unlimited! Wow, real wow! Wetin una dey wait for? Oya, let us all “hanlele” and “forward quick march” to the barracks of humility – to borrow Zebrudia-Jegede type of language! The Magnificat, which I call Mary’s love song also takes up this theme of humility. Read it loud, recite it and dance along with it and live it its core message in your every day life. See what the Lord has done to His lowly servant. Read it and marvel – see how God has exalted the lowly Mary, how he has filled the hungry with good things! Yes, God elevates and rewards the humble, those who like Mary called themselves the handmaid of the Lord, and those who surrender to his love, to his wisdom, to his beautiful purpose. Contrast this to the “reward” of the proud, the rich, the conceited whom he has scattered with their conceit and sent away empty. Read empty to also mean “deflated”, like a balloon that has pin pricked and which now engages in a zigzag of uncoordinated and direction-less motion as air escapes from it. Soon the former swollen balloon becomes hollow, form-less and crumpled and devoid of any bounce. Yes, it is now emptied…of its former force, of its former appeal, of its former beauty! All that “dengue pose’ don vanish patapata. All that shakara don go…all “dat waka kuru-kere” don finish. Ditto for the arrogant bounce! Given all this, the wise must flee vanity, arrogance and pride like pests. Yes, Choose humility! Leave behind your haughtiness, leave behind your pride, leave behind your sense of power and might, leave behind your self seeking…yes, leave all these things behind – they are vanities, yes, vanity upon vanity and lead us nowhere except to trap us in a ever widening circle of quick sands of beauty seeking, land grabbing, election rigging, embezzlement, corrupt practices, rent seeking behavior and arrogance – all of which end up sucking us into a morass of emptiness, spiritual, emotional and social, to bottomless emptied and emptying voids somewhat akin, and here I stray dangerously into physics, to Einsteinian type black holes from which once sucked in, return and escape are virtually impossible. Vanity, arrogance and pride are also like malignant tumors. They germinate, grow and flourish in souls devoid of spiritual nutrients and godly medication. In no time, they will be crowding out the live tissues of humility, self respect and respect for others. Soon, they will be suffocating and choking the living daylights out of you. Flee them. Run from them. Run to the new life. Embrace the new life – a life that stresses humility, kindness, mercy, contentment and openness to God and neighbor. Take a look around us and notice how those who have humbled themselves, those who have reasoned along the elevating humility lines of John the Baptist have been elevated.have stood out in contemporary history – Gandhi was an epitome of humility – yet his greatness lay there-in. Buddha was humble, so was Confucius. Coming closer home, Mother Theresa, Mandela..each story tells itself. Two men person go into a place of prayer – and one spends time running God through a documentary of achievements, good deeds, alms giving, fidelity in religious observances, self appraised moral correctness. The other simply kneels down and recalls and accepts his/her sinfulness and shortcomings and asks God for forgiveness and Grace to move ahead and beyond. God accepts the latter not the former! The message again is clear – God accepts the humble and comes against the arrogant. So are you humble? And if you are, what are the indicators of that humility? · tolerance for the views of others? · openness to criticism?, accepting you could be wrong? · not being boastful, arrogant or conceited? · adoption of simplicity and temperance as core life values? What are your answers to the questions above? And, what of this writer? Am I humble? I knew you would ask that question but would indeed you did not ask me – but since you have, I am not sure that I am, but I recognize my weaknesses and seek to address them. I seek humility, I flee pride, I seek the simple life, I seek God’s favors and His Graces for a life of faith, hope charity and humility and my journey is to learn and practice and to live these virtues. May it also be your lot to have these same Graces, Amen. I need to feel your Amen – say it LOUD. Yea! That was better! Now I can feel you! Simply beautiful nuggets of wisdom and life lessons of inestimable value. One more reason why children and us all must rediscover and recommit to reading! When writing for children, Madonna said it best: Papa, don’t preach. That means: no heavy-handed moralizing or high-horsey finger wagging. Kids get bossed around enough as it is, so why subject them to further instruction when they’re reading for pleasure? That’s not playing fair. 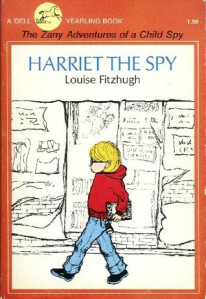 “Life is a struggle and a good spy gets in there and fights.” (p. 132).